In the recently released Netflix documentary “Fyre Festival”, you see Billy McFarland pay a few of the world’s top models to film a commercial on a remote island… to promote a festival that didn’t even exist. Once the festival sold out, he scrambled to try to deliver on his promises (Which turned into a disaster). After the event took place, lawsuits began to arise. A $100 million case quickly grabbed the headlines, but the more interesting complaint named not only the organizers but also the social media influencers as being involved. Kendall Jenner, Bella Hadid, and other influencers were being sued for fraud, negligent misrepresentation, and unfair trade practices. This shows that influencers need to be careful about who they work with, making sure that the company or product they work with matches their lifestyle and values. Otherwise, their credibility and authenticity towards their followers will disappear. This will impact their partnerships, since most brands and advertisers are doing their due diligence before partnering with potential influencers. Here are 6 cases of major influencer marketing fails, and what you can learn from them. While the influencers at Fyre festival unknowingly scammed their followers, others have done it intentionally. Jonny Craig (ex frontman of Emarosa, Dance Gavin Dance, and Slaves), for example. Back in 2010 - 2011 he allegedly scammed his own fans by selling MacBooks via his personal twitter account. After accepting payment for the product from at least 16 individuals, Craig discontinued communication with the buyers, and no MacBooks were ever distributed. This resulted in him being kicked out of his bands as damage control, leaving him with a reputation he still hasn’t recovered from. Either way: Before you start promoting a product, do your due diligence. Who are you working with? What’s their past? Does their product work? In this line of work, your reputation and credibility is everything. Imagine being approached by two different brands who’d like to use your services in the same timeframe for the same product. What do you do? Pick your favorite (and stay credible), or promote both (and ca$h)? Well, vlogster and fashion influencer Marije Zuurveld had the option to promote Daniel Wellington and Kapten Andson for Black Friday. Her solution? Promote both! Daniel Wellington on Black friday and Kapten Andson on Cyber Monday. Her fans and followers noticed, which resulted in being called out by other influencers! The main reason why brands are approaching influencers is because they want to promote their product in a credible way, with original and creative content. This results in a lot of work for the content creators; doing research, creating scenarios, etc. However, there are a lot of popular accounts. Eventually, everyone gets the exact same shot. How uninspiring and lazy! 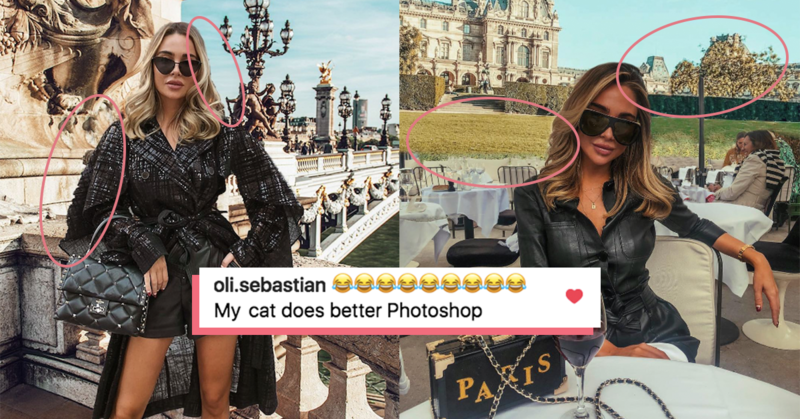 We all know that most travel bloggers’ Instagram shots have had more than a little help from the editing tools, but the swedish travel influencer Johanna Emma Olsson got a lot of bad press by (badly) photoshopping her travel photos. Fyre festival wasn’t the only social media campaign that delivered Kendall Jenner a lot of backslash, or did you forget about the Pepsi campaign she did? If you don't remember: the Pespi spot was focussed on the 'Black Lives Matter' movement and offended a lot of people, partly by casting kendall Jenner. Critics said she was only ‘protesting’ because of the money, not because she agreed with the BLM Values. Lastly, but definitely not least: one of the most common fails: Influencers who are being paid to post exactly what a marketing agency says they should. For Scott Disick, this meant “Copy, Paste & Post”. He clearly didn’t proofread his post, because he copy/pasted a whole email conversation in there. Oops! Once again, credibility is key. By trying to capitalize on obviously phoned-in efforts, you damage your reputation and thus potential partnerships as well as the trust your following has in you.